USGS MAP: Starting on the afternoon of Monday, April 30, 2018, magma beneath Pu‘u ‘Ō‘ō drained and triggered the collapse of the crater floor. Within hours, earthquakes began migrating east of Pu‘u ‘Ō‘ō, signaling an intrusion of magma along the middle and lower East Rift Zone. As of about noon on Wednesday, May 2, these earthquakes continue along the lower East Rift Zone, with many reports of earthquakes felt by residents in nearby subdivisions. The orange dashed line marks the approximate area within which most of the earthquakes are located based on automatic earthquake locations and analysis by seismologists. All earthquake locations are preliminary. UPDATE (9:50 p.m.) – Hawaii County Civil Defense reported the section of Pahoa-Pohoiki Road between Highway 132 (Kapoho Road) and Leilani Ave. is closed in both directions due to road damage. Detours through Highway 132 and Leilani Ave. are in place. (BIVN) – Videographer Mick Kalber returned to the sky above Puʻu ʻŌʻō on Wednesday for another look at the changes to the active vent on East Rift Zone of Kīlauea Volcano. 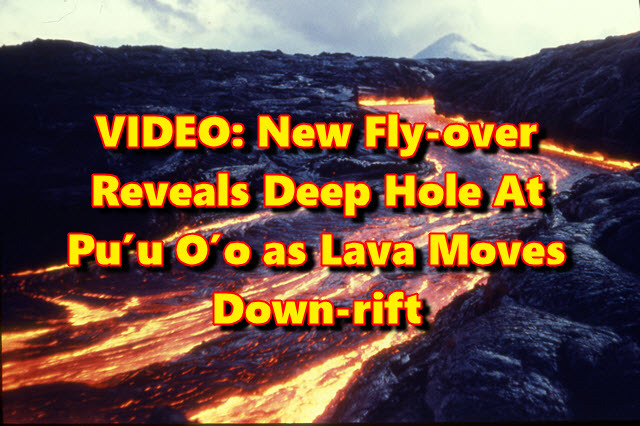 Flying aboard Paradise Helicopters for the second time in two days, Kalber was able to capture a different look at the vent, which is now a gaping hole hundreds of feet deep. Elevated rates of seismicity and deformation at Kīlauea Volcano along a section of the lower East Rift Zone east of the Pu’u ‘Ō’ō vent are continuing this evening. This activity is associated with the continued intrusion of magma into the East Rift Zone to locations east of Highway 130. An outbreak of lava from the lower East Rift Zone remains a possible outcome of the continued unrest. At this time it is not possible to say with certainty if or where such an outbreak may occur, but the area downrift (east) of Pu’u ‘Ō’ō remains the most likely location. Scientists of the Hawaiian Volcano Observatory will be on duty overnight to monitor the changing seismicity and deformation, and residents of the Puna District should remain alert and watch for further information about the status of the volcano; watch for Hawaii County Civil Defense messages at http://www.hawaiicounty.gov/active-alerts/. Elevated earthquake activity in Kīlauea’s lower East Rift Zone has persisted through the day, with many reported felt events by residents. Earthquake counts have decreased slightly since midnight in the area east of Highway 130. A tiltmeter at Pu’u ‘Ō’ō recorded steady, deflationary tilt during the day, with several sharp inflation offsets. These offsets probably recorded the continued episodic collapse of the crater floor. Some of these offsets corresponded to short-lived ashy plumes rising from the crater. Analysis of webcam images of the 61g lava flow field on May 1 indicates that surface flows within a few kilometers (miles) of Pu’u ‘Ō’ō have stopped advancing—the few areas of incandescence visible in the images did not move starting early morning on May 1. The 61g flow is likely no longer being supplied with lava from Pu’u ‘Ō’ō.